W.S. Gilbert had a love of paintings. Not only did he have a collection that included the likes of Duncan, Giorgione, Tintoretto, Maes, Van der Kappelle, C. Van Everdingen and an early Tenniel, but he also liked to set up an easel in the Drawing Room and paint sunsets himself. One of the most impressive paintings in this room though, is Frank Holl’s portrait of W.S. Gilbert. 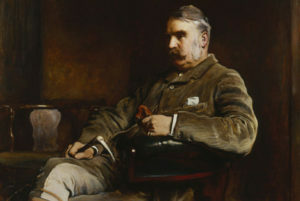 In November 1886, Gilbert commissioned Holl to paint his portrait. Gilbert requested sittings to be during late November and December and even gave Holl guidelines as to how long he thought it should take. The resulting three-quarter length, oil on canvas painting, was bought by Gilbert the following year, for the princely sum of £525. Frank Holl was an English Painter and royal portraitist. Born in London, on the 4th of July 1845, Francis Montague Holl came from a family of noted engravers. In 1860, at the age of 15, he began studying at the Royal Academy Schools – the oldest art school in Britain. Here, his work won several gold and silver medals, eventually leading to his first exhibition of two paintings at the Royal Academy in 1864. Several of his pieces achieved great success and even Van Gogh admired his work, writing to his brother Theo, to share his admiration. 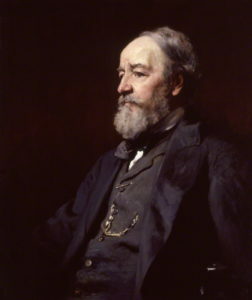 Holl’s major portraits included Lord Roberts (painted for Queen Victoria in 1882), as well as the Prince of Wales, in that same year, Mr Gladstone, Joseph Chamberlain, Earl Spencer and Viscount Cranbrook. Unfortunately, his work put a strain on his health – in part, due to the fact that Holl was incapable of turning down a commission. This first showed in 1877, whilst painting two pictures entitled ‘Hush’ and ‘Hushed’. By 1878 he was elected Associate member of the Royal Academy (A.R.A) and by 1883, Royal Academician (R.A). Holl continued to show his work regularly at the Royal Academy, until his death in 1888. He’s buried in Highgate Cemetery.